After the first installment of the trilogy " Get organized with EsferaiPhone September ", we continue to analyze applications can be useful not only in these early days and return to work after the holidays, but throughout the year can become our application header in the daily routine. In this case, continue with a selection and comparison of those applications, so from our point of view as from the positive reviews that arise between users, are the most appropriate and functional when entering text in a document, either quickly or, by contrast, more elaborate searching for input as to the editing of text. Today we will analyze, compare and list the pros and cons of three applications for iOS in processing text: iAWriter, Evernote and Pages. We start with an application of that once and I talked and commented on his departure for iPad . You could say "apparently" is the most simple of all, but is it actually is. With hyper minimalist design, simple function performs iAWriter processing input text, and makes old machine mode of writing. You just have to worry about typing the desired text. As options offered by the application, is its good timing with our Dropbox folder and iCloud account, copy text, send email text and display mode, you have the option of full screen for a better view of our paper. While it is a great app for users who do not want to worry about the process of editing text (underline, bold, color, etc..) May remain limited for those who value more editing or inserting an image file to your document. On the other hand, has the disadvantage that it is only available in English. 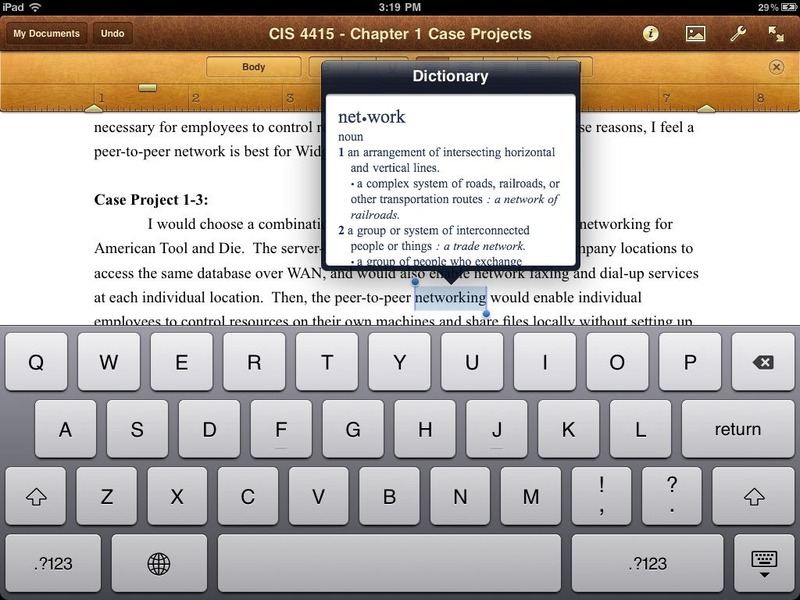 IAWriter application is available on the AppStore at a price of 0.79 € and is compatible for iPhone, iPad and iPod Touch. Certainly for many, if not most users highly value note taking, text-annotation type or all at any time, Evernote is shown as our main application for this. With this application, we have organized basically all we want, from a simple text document to create a shopping list, to save text from web pages, share notes and documents with your contacts, or create and access audio notes and images taken from the application itself. For analysis of word processing option, we can say that has all kinds of options. In addition to its own previously analyzed application, offers all kinds of possibilities as text editing and inserting elements (image and audio files) to our document. It also has the ability to export your notes and documents to PDF format. Undoubtedly, the strongest point of the application, along with the multitude of options provided, is its excellent ability to sync not only with iOS devices, but we have all the content of our Evernote account in our computer, all in Castilian. Evernote is available in a universal way in the AppStore for a free, obviously support for iOS devices: iPhone, iPad and iPod Touch. Turn came to speak of the official Apple application for editing and word processing: Pages. Recently all users begin to agree that increasingly more surprised in a positive sense, as it gives functions of a desktop manager text, such as the case of templates for creating documents. From Cupertino are working hard and good work is coming to light regarding the stability and speed of the application, which is why we have said, each time has greater acceptance. 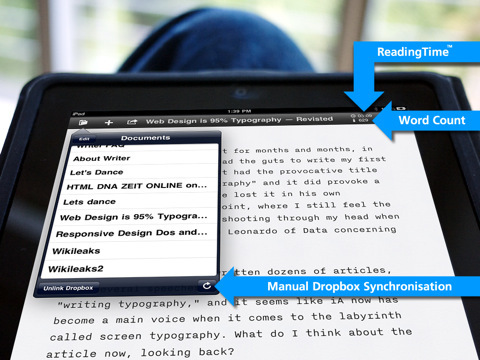 As for the text input options, not as complete as Evernote, but supplements these shortcomings, obviously, with the best synchronization with iCloud (even better with OSX Lion Mountain), where we will have our document available immediately in all our devices can continue to work from either of them. On the other hand, has the ability to attach not only image files, but also tables and 3D graphics, but above all, and what else is enjoying the users, using the default templates and as maintained by Apple. In short, this is a very good application in terms of editing and word processing, which can be short on choice (convert to PDF for example) and that its price is high for the features that are especially comparing it with other applications that provide many or more functions, which are found at a lower price or for free, as we have discussed. 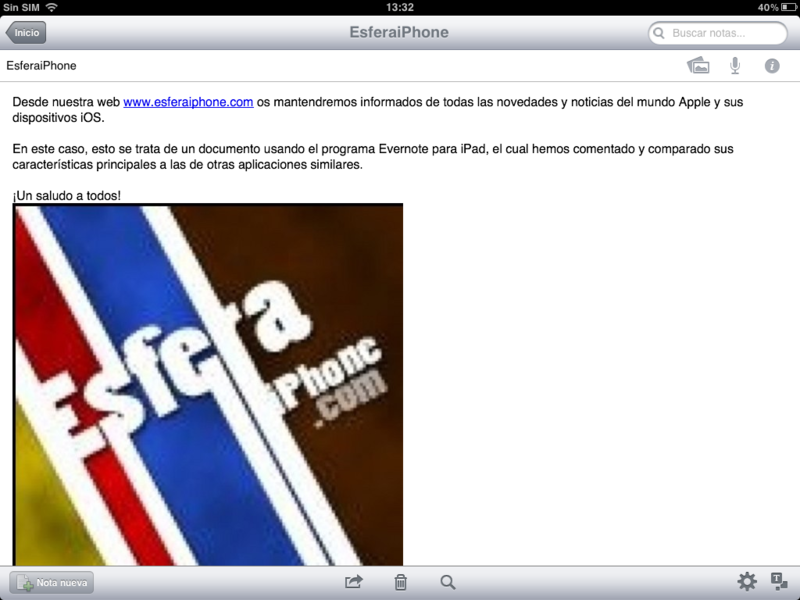 We can find the app in the App Store at a price of 7.99 €, being universal for iPhone, iPad and iPod Touch. As always, since EsferaiPhone try to offer the best range of possibilities in terms of applications on the topics we present you, so here you have two other applications for processing and text input, which you may find useful: Daedalus Touch and Text Writer. Do not hesitate to send us your opinions and experiences about the / s / application is using word processing and characteristics do you value in an application of this type.